Jazz Daily Social Recursive Offer provides 200MB Internet in just Rs. 5/- only. Jazz Prepaid customers can activate the offer by simply dialing Jazz social package free code *455# and can enjoy absolutely FREE Jazz Super 4G Internet for WhatsApp and Facebook for 24 hours. 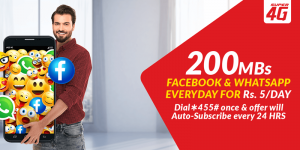 Jazz Prepaid Mobile Internet users will only need to subscribe to this offer once and then will automatically be re-subscribed to Jazz Daily Social Recursive without having to dial activation code. Please let us know in the comments section below if you found Jazz Daily Social Recursive Offer | Get 200MBs for Facebook & WhatsApp in Rs. 5/- helpful and interesting.